In this blog post, I would like to share my thoughts how to build a pluggable Angular Frontend with modules which you can combine together like a puzzle. Modules should not know each other — that means, they don’t have cross-dependencies. Modules should be lazy loaded at runtime by means of backend configuration which specifies what modules your UI has exactly. In other words, the functionality scope depends on the logged in user, more exactly on the user role, such as “customer”, “developer”, etc. You got the idea. In the first part, I will explain the bootstrapping process of such lazy loaded modules. In the second part, I will try to describe how the modules communicate. This inter-module communication happens by so called extension points — a well-known concept (design pattern) from the Eclipse RCP world. 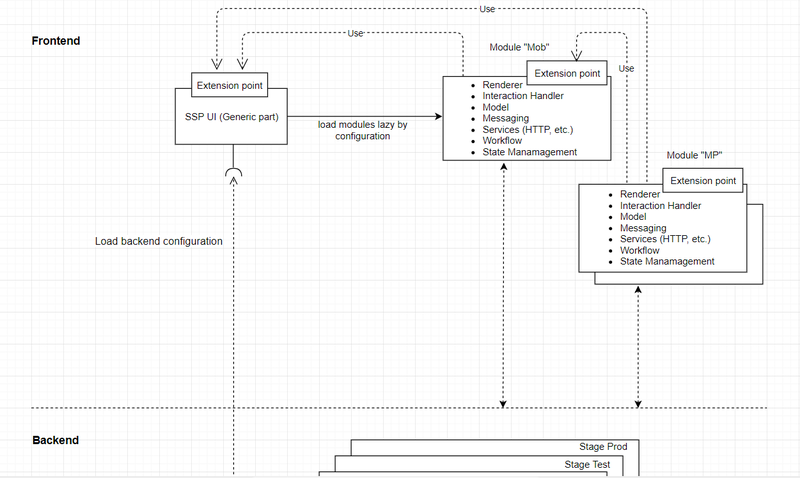 In the picture above, you see a diagram from my current web project called “SSP UI”. There is a core module. This is a core part doing bootstrapping. The core module is always present in the application. Every other separate module may reference this core module. The core module on his part doesn’t know about specific code of separate modules (no references) because such modules are loaded at runtime. Otherwise, the project would not be compilable. Netanel Basal has already blogged about how to load non-routable modules in Angular: “The Need for Speed: Lazy Load Non-Routable Modules in Angular”. He used a special loader — SystemJsNgModuleLoader and explained very well how to load modules by components. In his example, a modules’ root component was created and injected dynamically. But how to lazy load modules with providers? Imagine, you have a lot of services (and probably no components) in your modules which you want to instantiate with the help of the Angular dependency injection. Well, first, you need some configuration file where you reference modules in a similar manner as in the routes with loadChildren. Second, you need a service, say ConfigurationService, in order to be able to load the configuration. The configration should be loaded before the application is completely initialized. Angular has a special provider token for that — APP_INITIALIZER. Note, the factory method returns a Promise. Once the Promise is resolved, Angular starts the bootstrapping process. The main AppComponent uses the Facade Pattern. Note, that we’re doing the shutdown work within the window’s beforeunload callback. Why not in ngOnDestroy? Because ngOnDestroy only works when the route is changed. We also need the root injector for our main goal— bootstrapping providers of lazy loaded modules. The facade utilizes the ModuleLifecycleService which I will show in a moment. This service exposes two methods: bootstrapApplication and shutdownApplication. The first method returns a boolean Promise notifying the caller if all modules could be successfully loaded or not. After this short pause, we continue our adventure. Let’s define two interfaces. The bootstrapApplication method in the ModuleLifecycleService accesses the mentioned above configuration. Every NgModuleFactory is loaded through the NgModuleFactoryLoader. Here is the full code. We’re going to discuss the handling of module factories shortly after you have looked into the code. Create NgModuleRef by means of the root injector. NgModuleRef represents an instance of an NgModule. We need it in the next steps. 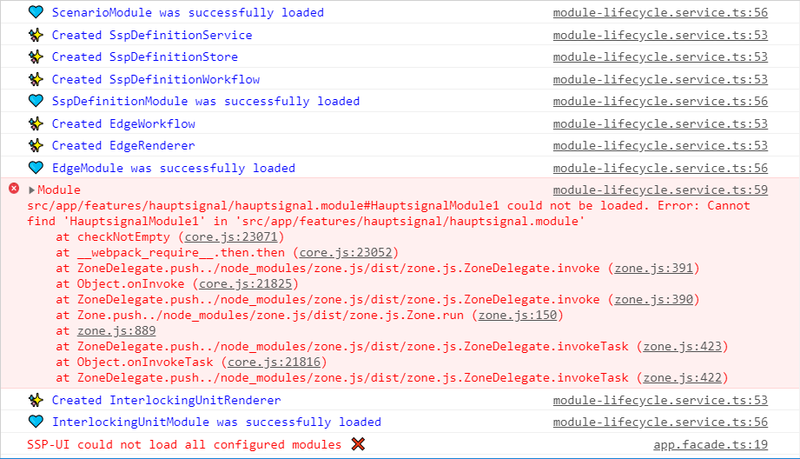 Check if the module has components (remember the static field components?). If it’s true, a ComponentFactory is created and saved in the model. The ComponentFactory is needed later if you would like to create the corresponding component dynamically. See Angular documentation for more details. Check if the module has providers (remember the static field providers?). If it’s true, the providers are registered and instantiated programmatically. This can be completed with the help of Injector.create(providers: StaticProvider, parent? : Injector). See Angular documentation for more details. If you make a mistake in the configuration, e.g. a typo in the module’s path or name, you will face an exception. If a module has no providers, it’s a little bit strange. Right? In this case, you will face a warning. That’s all. Stay tuned, the second part with extension points is coming soon!